More and more people are opting to work from home these days, often setting up their own home office. While some may make due with a very simple desk or a second hand piece of furniture, others insist on having the best furniture in their homes, no matter what room it is going into. In Columbus, Ohio, home office furniture can be found in at Amish Originals Furniture in a wide range of sizes, colors and designs. In addition to single pieces, there are a number of office collections that take all of the guesswork out of your perfect office. Depending on the size of your room, you may only need a nice desk and a comfortable chair so that you can get your work done. But, eventually, you might find that you need at least some moderate storage solutions- you will likely have a few drawers in the desk that you have selected, but you might need even more. 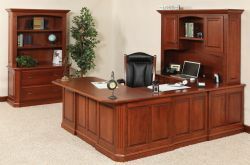 Real wood furniture, like that found at Amish Originals Furniture, has a very serious advantage over other types. If you cannot afford to buy a whole room full of furniture at one time, you can choose to add pieces as you are able without a problem as long as you match the finish of the wood that you have selected for the largest piece. Another option is the office sets. There are five to choose from: The Buckingham U Shaped Suite, the Homestead, the Jefferson, the Lexington, the Manhattan and the Buckingham Executive suite. Each of these options come in a range of colors and finishes including the oak, brown maple, walnut, cherry, and white oak. Depending on the style that you have selected, you will get a desk and at least one type of storage to complete the appearance of your new, updated home office. Who wouldn’t be inspired to do incredible work in an office this gorgeous? These are fairly sizable options and since they are made of real wood, may be too heavy to move on your own. If you are in the Columbus Ohio area, you can have your selection moved to your home and even set up in your home office for a small fee. If you are farther away, you can still have the same professional delivery and set up for an additional fee. Considering the weight of the gorgeous Buckingham U Shaped suite, the extra fee is entirely worth it. Amish Originals Furniture takes great pride in the handmade furniture options that it sells in its Columbus Ohio stores. Each piece is made by a group of seventy Amish artisans and while there are some designs that are similar, it is important to understand that natural wood will always have some variations and unique features like knots, lines and others. Most people who are looking for Amish furniture consider these to be valuable because they add beauty and character to the piece.